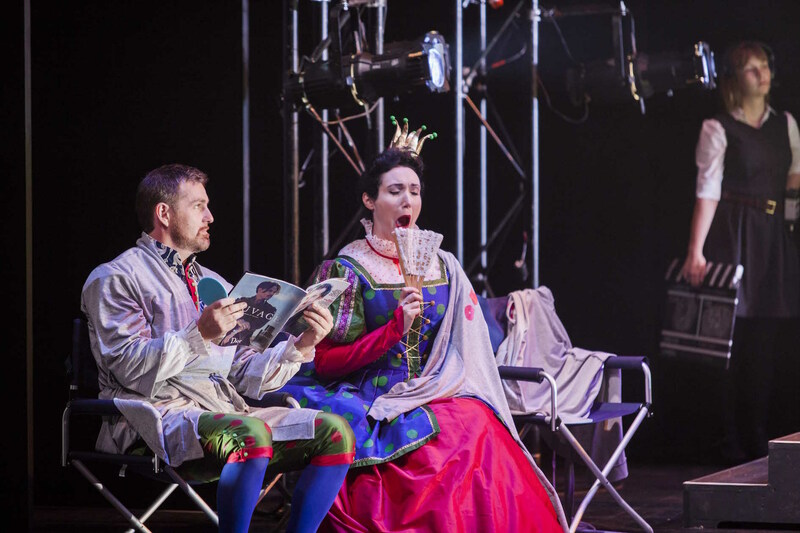 Victorian Opera presented another authentic introductory opera experience with this highly accessible, sweetly amusing production of The Princess and the Pea. The combination of a brisk forty minute running time, brightly coloured staging and excellent performances ensured that even the youngest audience members were actively engaged throughout the opera. Director Libby Hill and team had the clever idea of setting the production in a television studio. 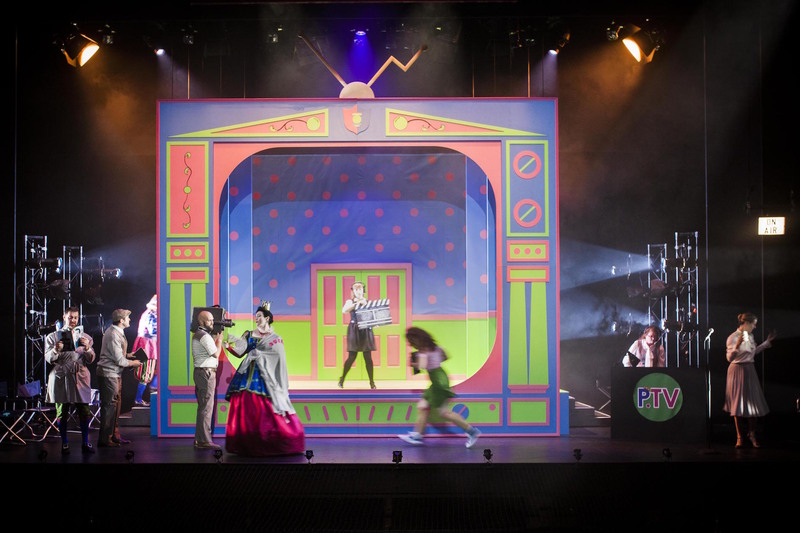 The opera of The Princess and the Pea was being filmed for P.TV, and the cast and crew of the program scrambled to keep live action flowing on camera. Moments of slapstick comedy with the mattresses added to the enjoyment. As with 2016’s Cinderella, the surtitles briefly described each scene rather than providing literal translations. To aid understanding even further, the television studio concept allowed for the use of a TV Presenter to act as a narrator. Between the surtitle descriptions and the introductory narration, the scenes are still sung in German, and that is where the imagination of the young viewers really takes flight as their minds fill in the story as they watch the action unfold on stage. Given the short season of The Princess and the Pea (just three performances on a single day), the scale of production was extremely impressive. Designer Candice MacAllister used vivid colours to create a rich Technicolor world. The dotted pea motif on sets and costumes alike was a witty touch. A particularly clever touch with the costumes was the use of pale greys and browns for the television crew so that the neon tones of the Royals and Nobles on stage made a striking contrast. Adding to the genuine opera experience was the presence of a 15-piece chamber orchestra, made up chiefly of musicians from Orchestra Victoria. Conductor Fabian Russell showed a deftly light touch with Ernst Toch’s music, bringing an appealing playfulness to the unfamiliar score. Toch contrasts the mainly light-hearted elements of the score with slower, lullaby-like music when the Princess is trying to fall asleep. 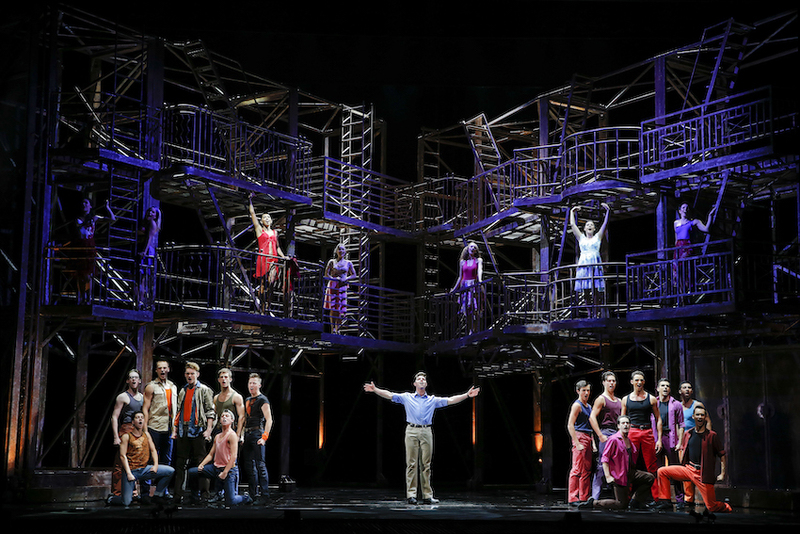 The luxurious casting featured a uniformly strong company of singers, each of whom was also able to add to the comic stylings of the piece. Jerzy Kozlowski and Kathryn Radcliffe played the stuffy King and Queen, with their son the Prince played by James Egglestone. 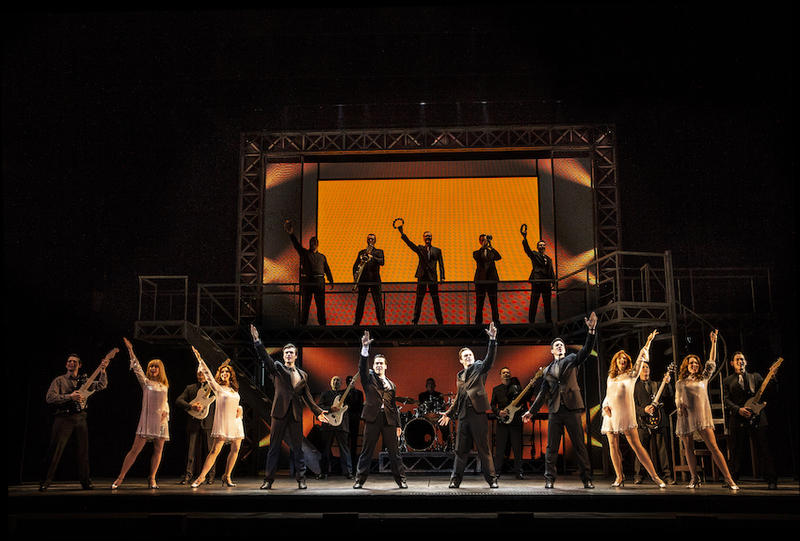 Michael Lampard and Michael Petruccelli played TV crew who, in the chaos of live television, were drawn into the onstage performance. 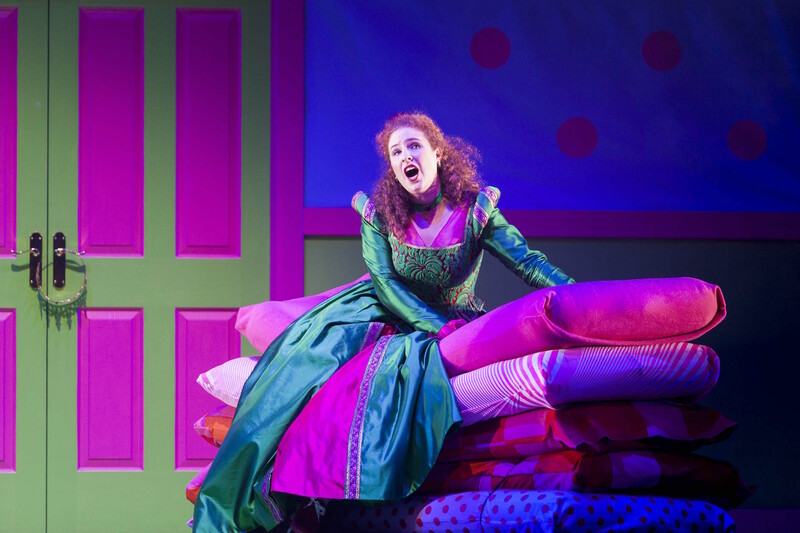 Vital and versatile mezzo-soprano Dimity Shepherd was an absolute delight as the radiant TV Presenter, projecting an engagingly animated manner when she was drawn into the mattress action. Young soprano Olivia Cranwell was perfectly cast as the Princess, singing the role beautifully and maintaining an adorable presence on stage. Miss Six, my theatre partner for the day, laughed at the physical comedy and followed the traditional story with ease. At the final curtain she was disappointed that it was all over so soon. 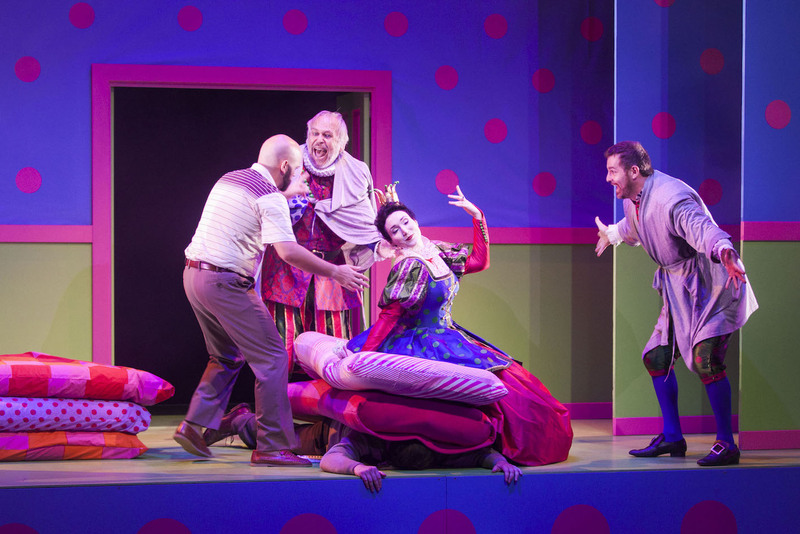 The Princess and the Pea played three performances at Playhouse, Arts Centre Melbourne on Saturday 25 March 2017 (reviewed at 2pm). 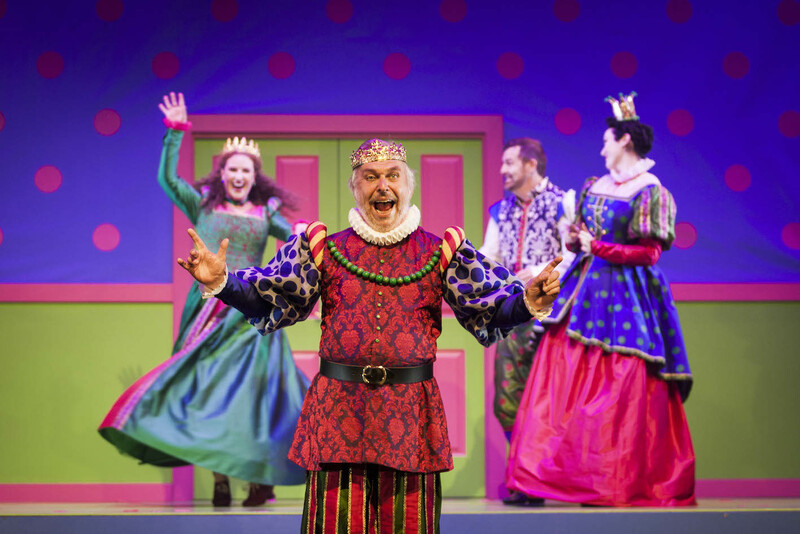 The program for The Princess and the Pea can be read online.